Human robot collaboration via cobots are improving productivity and boosting efficiency on the shop floor. Automatica 2018, the leading exhibition for smart automation and robotics chose this theme as one of its main topics. Reason enough to take a look at the recent technologies along with future predictions for the global cobots market. The collaborative robots market is expected to be worth 4.28 billion dollars by 2023, predicts market research firm, Markets and Markets. 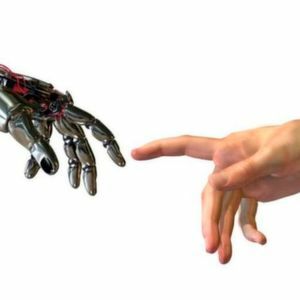 Collaborative robots aka ‘cobots’ are the new generation of robots that engage in human robot collaboration. With cobots, humans can work alongside robots on the same shop floor without any barriers and offer greater flexibility in the production process. In a human robot collaboration set up, cobots perform the monotonous and physically heavy work with utmost precision while humans control and monitor their production. Used extensively in the automotive and the electronics industry, many people around the globe like to believe that robots will replace the jobs of humans but this is not the case. Cobots complement the work of humans thus giving them space to focus on other areas in the production process. Some of the major players in this segment include ABB, Epson Robots, Universal Robots, Omron and many others. 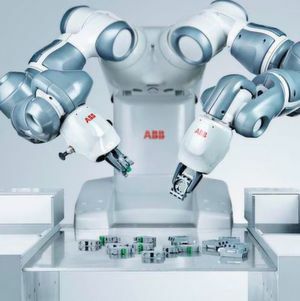 ABB has introduced the single arm ‘Yumi’ cobot, an upgraded version of its two armed predecessor. Set to be officially launched this year, the new compact cobot has a payload of 500 grams and can be easily integrated into existing assembly lines. Yumi features lead-through programming and is designed to meet the requirements of factories of the future. The cobot ensures greater reliability, efficiency and also reduces the need for specialized training for operators. In the electronics field, the France-based company, Thales Alenia Space has launched Cratos (Collaborative Robot Addressed to Operative Solutions), the first multi-purpose cobot to integrate electronic equipment. The cobot looks after assembling and bonding components and parts, as well as checking these operations. Increased production in a shorter period of time is the core benefit of these cobots. Cratos is currently being used to integrate electronic components into the first COSMO-SkyMed second-generation radar Earth observation satellite. Systems to support cobots have also been launched. For instance, in the US, Universal Robots and ARC Specialties together have come up with the first MIG welding robot for collaborative robots in the country. The company has introduced the SnapWeld collaborative welding robot package that features seamless hardware and software integration through the Universal Robots+platform. SnapWeld is a cobot-assisted, interactive welding system that can be used easily and flexibly in existing manual welding booths. This system eliminates the need for costly new robotic cells and is portable in nature. According to the International Federation of Robotics (IFR) report, cobots are expected to drive the automation market. The Americas region is expected to see strong continued cobot growth. China on the other hand is predicted to remain the main driver of robot growth, expanding its dominance with almost 40 % of the global robot supply being installed in China by 2019. Cobots are cost effective and offer better ROI (return on investment) due to which they have become hot favourites for many SMEs around the globe. Going forward, high demand will be witnessed across the automotive, plastics, electronics assembly and the machine tool industry for compact, user-friendly collaborative robots. Cobots are set to transform the manufacturing processes of the future.